Sold a little bitcoin that I've been holding for a couple years. This is too crazy of a rip to not lighten up a little. Will let the rest ride. Good move. Nothing lasts forever and the blow-off top will eventually happen. We've all seen parabolic moves before. Thanks. I think it has potential long term and I'm young enough to let some ride. Honestly thought about selling all of it to raise cash for summer phys buying, but usually my most painful trades end up being the biggest winners so thinking it's best to let some profits run. If it keeps running higher into summer I'll consider selling some more...still not sure I wanna sell all though. 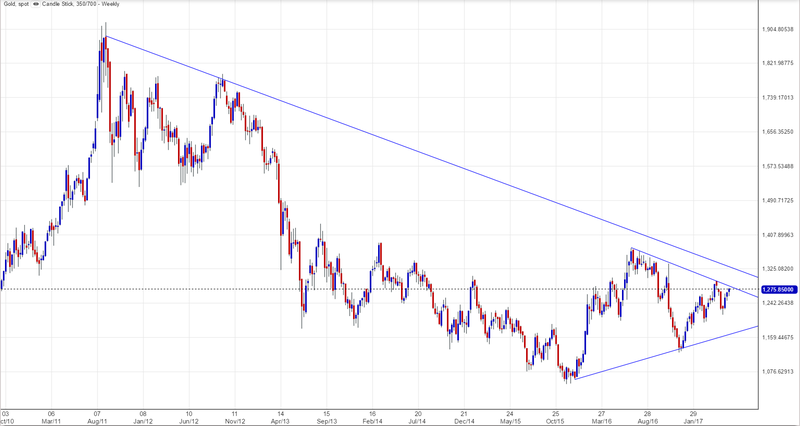 Gold finally breaking out of the down trend? Finally? Really? The gold chart is certainly looking interesting. The downtrend line was formed from the September 2011 high and the November 2012 bounce. That formed a downtrend line that has not been broken since it was established nearly 5 years ago. It seems that we are breaking this now. This could mark the end of the downtrend in gold. 1) We are on the eve of an 8.6 year bull cycle in commodities, in general. 2) Gold is perhaps breaking out. A monthly closing above $1362 will confirm the end of the downtrend. 3) A last minute drop to $1000 is still not impossible. But this must occur before the end of the year. Either way we are finally close to the bull market that the gold bugs have been saying is just around the corner since 2011! Man! It's like giving birth! Titus I can't tell what is going on in that chart because of quality, but I think the resistance you are looking for is somewhere about $1,320 at the moment. Gold is about $5 away from resistance in an important pennant that would shoot gold through that resistance area if resistance was broken, but I'm pessimistic and I think gold will head towards $1,180 support, then to new lows. Weasel, I guess it is a difference in Technical Analysis style. Your downtrend line seems to be generated by connecting the open prices. I'm following the Armstrong TA style which generates the downtrend line by connecting the highs. The two styles generate slightly different lines. But I would agree with you that this could be a false move. It would be great if you were right! We are breaking the downtrend line. The breakout must be confirmed by a monthly close over the monthly bullish reversal of $1362. This could be a false breakout. Perhaps followed by new lows. Even if we don't breakout now and do see a new bottom, this should be over before the end of the year. The bull market that started in 2001 is not over. Gold has never closed a year beneath the yearly bearish reversal. Sorry the quality is not better. I can't figure out how to generate a better diagram. hmm, I guess I can't see that being a real resistance area. The evidence I have is that there was an open and close above resistance, and no breakout. If you don't understand the significance of this, God help you!!! Yes. It's just a different system, that's all. No line drawing technical analysis is ever going to always be perfect. There's no such thing. If there were, we'd all be millionaires! Imagine if the line broke and you had a 100% guaranteed trade! It's never going to happen. Just stick with one and get to know it. Don't forget that the real bull run needs most investors caught on the wrong side of the trade. Keep that alongside the charts. That alone tells me we're going down again before the long bull. Agreed, but the process need not take long, no? Assuming the Comex as the forum, smash the longs with enough naked shorts to get the spec momentum shorts on board, then with the longs routed, smash the spec shorts in turn as you let the price rise. Slaughter everybody, the house always wins. Am I missing something? So yes, down as a prelude to up. Other fundamentals to consider; price must remain high enough for the bell-weathers Barrick and Newmont to remain profitable, and maintain supply. There is not much further for price to fall, according to this metric, except for short periods. It can happen slowly as well as quickly. And who knows, maybe trouble at Barrick would draw in more than the average bear. Lots to consider about getting most to take the wrong side of the trade. When I look at the charts right now I have to work hard (too hard) to make them tell me a story about direction. That's a setup for making the charts tell a story that I already believe (confirmation bias). Still OK with taking the long side here but if it falls yes the next stop is $16.20 ish. That would be OK because I'd be pretty comfortable taking a larger long position then. Added a little more to the long side when Ag hit 16.50. So buckled up. Get ready for the time of your life. Such opportunities come once in a few generations, not even in a single lifetime. I guess most Armstrong followers have been waiting for this trade for some time now. I read Armstrong regularly and have for years although he continues to move his best stuff to the pay model. This sure as heck sounds grave enough. On the other hand it sounds like any other huckster out there promising 'you DON'T want to miss THIS' hahaha. I don't have access to his recent track record but always liked the calls that come from his software and data. Depending on the price this is the time to see what he has to sell. Whoops forgot to say that yes, as a follower I've been waiting for MA to make this call as he's been talking it for a long time. As has our own AM in the Setup for the Big Trade - which I also follow. Have not picked a team all week. The failed retest of $16.60 didn't look good, but silver is not too eager to move heavy in any direction. I don't know if we will close above $16.60 by Friday... I think it is more likely we see $16.22, then new lows on Monday. Yes there's no team to pick this week. It looks like the battle for 16.50 is being waged again but this time from the lower side. Looks like silver just pushed past $16.60... probably joining you tomorrow!